The Luxury Collection - Rex | Florim Ceramiche S.p.A.
Those who choose Rex want to immerse themselves in glamour and sensuality. They seek luxury and elegance. They want a modern and decisive style. Each porcelain tile collection embodies a story. The pattern tells of stylistic trends that are different but matched by the constant reference to warm and welcoming atmospheres. Rare, precious and intimately connected to mankind’s way of life, the material is reinterpreted to express the concept of the modern ambiance. The result of bold creativity, Rex gives decisive character to the space, catering to its natural inclination to beauty. 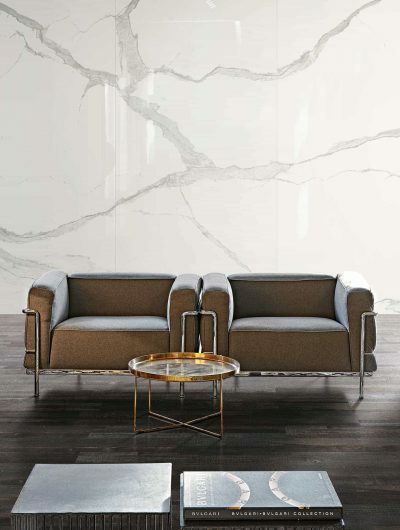 Veining and décor, even on very large sizes, take the concept of elegance to extremes to create dream environments. REX represents the haute couture of style, standing out for the high quality of the surfaces offered and the precious details.